Yum! I found this tasty, cheap "pork" gluten at my local Asian market. So far we've done hot BBQ pork/cucumber sushi. It's delicious grilled with sauce. So I decided to make wonton soup. I wanted the soup to be simple and the dumplings to be the star. Have I said a million times that I love dumplings of all sorts? You can also make these dumplings (do a simple triangle) and pan-steam them. Yum! 6 tsp/2 Tbsp Better Than Bouillon vegan "chicken" broth, or vegetable broth. -Soak mushrooms in hot water for 20 min. If using fresh, saute and set aside. Chop small. Can use water in broth for soup if desired. -Heat a large skillet and add 1 tsp peanut/other neutral oil. Fry garlic, ginger, and chili pepper for about 30-45 seconds. Do not burn garlic because burned garlic will make everything bitter and it can't be fixed. -Add "pork", soy sauce, and sesame oil and saute about 2-3 minutes, until mixture is not too wet. 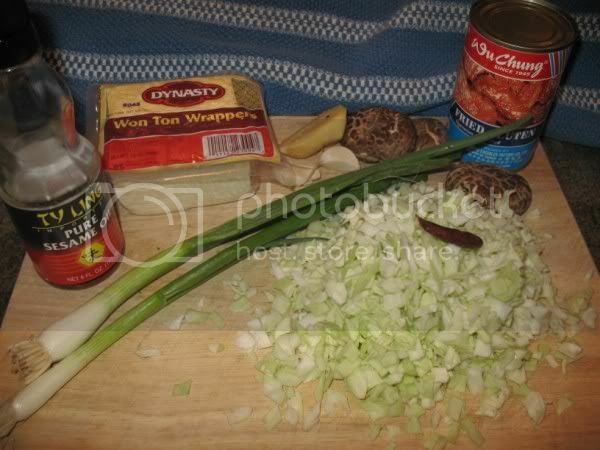 -Add cabbage and a small handful of chopped green onions. Cook until cabbage is tender and wilted. Cool to room temperature or colder before making dumplings. 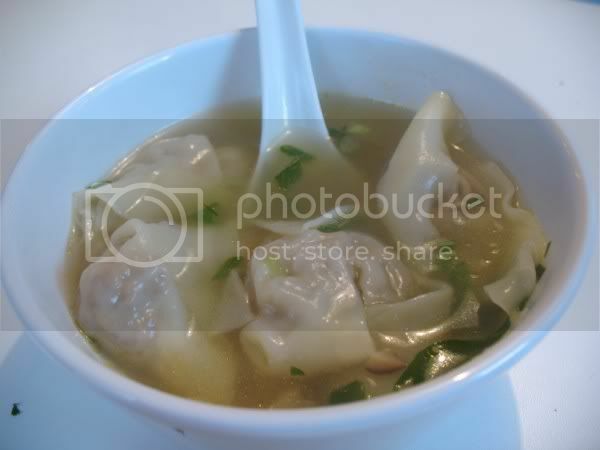 -Shape dumplings as desired, using 1/2-1 tsp filling per wonton. Do not overstuff. Here is a great demonstration with 3 different folds, from Cmtoy on Youtube. Video posted with permission. -Heat water to dissolve bouillon; boil and add dumplings. Add mushrooms and rest of green onion. Cook about 2 min or until dumplings are not starchy-looking, and wrappers have tightened around filling. Finish with sesame oil and extra soy sauce to taste in the broth. Yum, Pamela! That would really hit the spot right now. Delish! I want to make those! I found your blog through someone else's blog (can't remember whose) about a month ago and I've been checking it regularly ever since. Your food looks fabulous! i can't wait to make this, looks amazing! This Cake. Is so. Good.